You'll be £10.19 closer to your next £10.00 credit when you purchase M1 Abrams. What's this? The story of the Abrams begins in the late 1960s when the threat of Soviet Armor developments forced the U.S. to look for a suitable replacement for the M60 series. A joint venture between the U.S. and West Germany to build a suitable common Main Battle Tank brought about the unorthodox and terribly expensive MBT70. It never saw series production. When this program was cancelled in 1970 a quest for a more cost-effective tank was begun. The constant development, upgrade, and conversion of the series have kept the Abrams at the forefront of main battle tank technology, and it has proven itself on the battlefield time and time again. The Abrams is entering its fourth decade of service with U.S. forces and the plan is to keep the vehicle in the United States’ inventory through as late as 2040. The original design of the M1 was conceived to allow the installation of the smooth bore M256 main gun with only minimal modification. The gun was a German Rheinmetall design for the Leopard II. With additional improvements to the armor, transmission, engine, and the addition of an integrated nuclear, biological, and chemical system, the new production M1A1 Abrams was standardized in 1984. Production at the Detroit Arsenal was now under the control of General Dynamics Land Systems. The production of the M1A1 ended in 1993 with over 4500 produced. The new main gun greatly increased the tanks firepower. In 1988 a layer of depleted uranium (DU) was added to the special armor array in the front of the tank. This gave the tank unprecedented protection for the crew. The tanks were also equipped internally by powered blast doors which separated the turret crew from the ammunition storage in the turret’s rear. This also increased crew survivability in case the tank was penetrated in this area. The story of the M1A1 will be forever linked with images of the 1st Gulf War of 1991. Never in the 100-year history of armored warfare has such a dominant weapon appeared on the battlefield with almost complete impunity form its adversaries. In that brief conflict the tank achieved an almost perfect balance of firepower, mobility, and protection. A book that for anyone who wants to get acquainted with modern means is essential, anyone who is fond of tanks cannot fail to include it in his library. 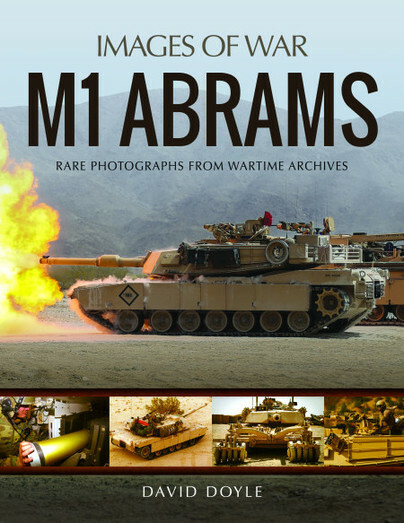 The 227 pages in this book are packed with a very complete and detailed photo coverage of both internal and external features of the evolving Abrams over the years and perfect for the armour modeller as they are all in colour. Definitely recommended.